[prMac.com] Coburg, Germany - Software developer, Felix Lisczyk today is proud to announce the release and immediate availability of SnipNotes 1.0, a new iOS app that lets users quickly store small text notes (called "snippets") and perform actions on them right from notification center. For example, users can call a phone number, open a webpage, write an email, view an address in maps or simply copy the stored text for use in another app. Snippets can be saved quickly from clipboard via the integrated widget or entered manually inside the main app. 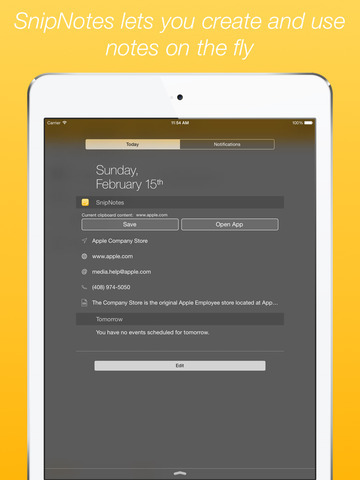 Snippets can be synchronized through iCloud for easy access on any iOS device. SnipNotes analyzes the snippets and shows an appropriate icon for fast recognition. Inside a snippet the matching text is highlighted and can be tapped for quick actions (e.g. make a call). Users can mark their favorite snippets and view them from inside the notification center widget. From here they can perform the same quick actions by long pressing on an entry or simply copy a snippet to clipboard by tapping on it. Storing snippets inside SnipNotes is quick and easy. The widget provides a "Save" button, which reads the current clipboard content and saves it as a snippet inside the app. Users can also enter a snippet manually and enrich it with a displayed title. Snippets can be sorted and shared to other apps. The app is fully functional and doesn't include any advertisements or in-app purchases. Synchronization of snippets takes place through the user's private iCloud account. Snippets are not stored elsewhere and can only be accessed by the user. SnipNotes 1.0 is only $0.99 USD (or equivalent amount in other currencies) and available worldwide exclusively through the App Store in the Utilities category. Promo Codes are available to members of the press. SnipNotes was made by Felix Lisczyk, an iOS developer living in Germany. All Material and Software (C) Copyright 2015 Felix Lisczyk. All Rights Reserved. Apple, the Apple logo, iPhone, iPod and iPad are registered trademarks of Apple Inc. in the U.S. and/or other countries. Other trademarks and registered trademarks may be the property of their respective owners.